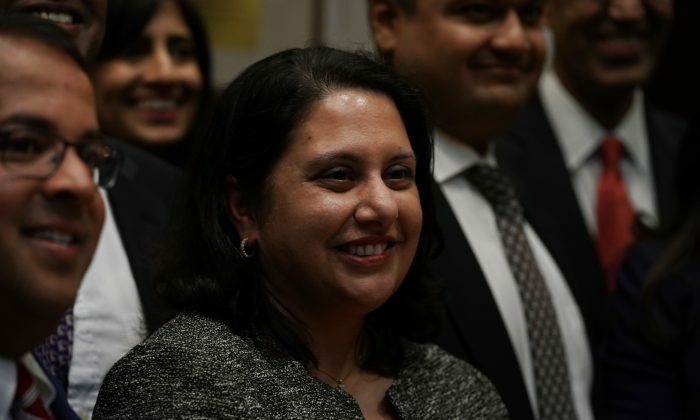 President Donald Trump said he plans to nominate respected regulatory scholar Neomi Jehangir Rao, currently the administrator of the Office of Information and Regulatory Affairs (OIRA), to fill the empty seat on the influential District of Columbia Circuit Court of Appeals that was created when Justice Brett Kavanaugh was recently elevated to the Supreme Court. Rao has been an important ally for Trump as he slashes what he considers to be excessive federal regulations that shackle the nation’s businesses and impede economic growth. Shortly after taking office, Trump signed an executive order spelling out his goal of cutting two regulations for every new regulation added, one of his often-emphasized campaign promises. Rao’s appointment to OIRA, an office within the Office of Management and Budget (OMB) that reviews draft regulations and oversees government-wide implementation of policies, signaled to observers at the time that Trump was serious about reducing bureaucratic red tape. The Senate confirmed Rao as head of OIRA on July 10, 2017, in a 54–41 vote, with five senators abstaining. Rao’s pro-limited-government philosophical outlook could draw the ire of Senate Democrats during her approaching confirmation process for the circuit court. Democrats are angry that Kavanaugh was confirmed to the Supreme Court and are looking to score points against the Trump administration in the lead-up to the 2020 presidential election. This, coupled with her association with the agenda-setting conservative legal group, the Federalist Society, could make Rao a convenient target for Democrats hungry for political payback. If confirmed to a lifetime appointment to the D.C. circuit, which has a heavy diet of regulatory cases, Rao, 45 may be in a position to carry on her work reining in the administrative state and possibly to springboard to the highest court in the land. The busy D.C. circuit is considered to be the second most important court in the United States. To borrow an expression from the world of sports, the circuit is considered to be a kind of farm team on which future Supreme Court justices are groomed. Current Chief Justice of the United States John Roberts, along with Supreme Court Justices Clarence Thomas, the late Antonin Scalia, and Ruth Bader Ginsburg, all sat on this circuit court before moving to the Supreme Court. Judge Merrick Garland, President Barack Obama’s stalled Supreme Court nominee, sits on the D.C. circuit. Janice Rogers Brown, an intellectual leading light among libertarian-leaning legal thinkers, sat on the court from 1996 until she retired a year ago. The Supreme Court nomination of their former colleague, Justice Kavanaugh, was cleared by the Senate Oct. 6 after a particularly bruising confirmation battle. Trump unveiled Rao’s nomination Nov. 13 during a lighting ceremony at the White House honoring Diwali, the festival of lights observed by Hindus, Sikhs, and Jains, unexpectedly moving up the announcement by one day. Trump boasted the nomination could be the “biggest story” of the day. She earned a law degree from the University of Chicago Law School in 1999, after which she worked as law clerk for Judge Harvie Wilkinson of the U.S. Court of Appeals for the Fourth Circuit, and then as law clerk to Supreme Court Justice Clarence Thomas. A constitutionalist, Rao is renowned for promoting the separation of powers doctrine in the three branches of the federal government, according to E&E News. “She has maintained that Congress should not delegate legislative authority to federal agencies and has called for more presidential oversight of them. She has favored extending OIRA review to independent regulators. Confirmation hearings for Rao haven’t yet been scheduled.